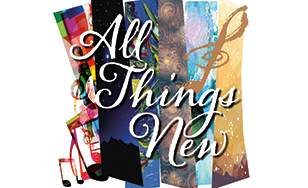 St. Scholastica will host the Twin Ports Choral Project for "All Things New," a musical performance examining the Bible's apocalyptic Book of Revelation at 7:30 p.m. Friday, Feb. 22, in Mitchell Auditorium on campus. Led by artistic director Dr. Bret Amundson, the Twin Ports Choral Project presents an invocation of the Book of Revelation's persistent themes of good and evil clashing in anticipation of God's re-creation of the world. Dr. Amundson is dean of the School of Arts and Letters at St. Scholastica. The program, featuring guest conductor Dr. David Chin, will highlight music by composers Hugo Distler, Jan Sandstrom and Frank Martin. The Twin Ports Choral Project is a local group that inspires, engages, and educates audiences by sharing innovative and informed choral music performances. This event is open to the public. Tickets are $15 and can be purchased at the door or in advance through the Spotlight Box Office, online at spotlight.css.edu, via email at spotlight@css.edu, or by phone at 218-723-7000.